Glass microfiber filters offered in this product range are produced from 100 borosilicate glass microfiber without the use of binders or strengthening agents. These filters offer many advantages in a wide range of analytical applications. GRADE A-83 - Imagine the loading capacity of a binderless glass microfiber filter with the tightly regulated pore size of a microfiltration membrane. Now it's possible with Grade A83. This new grade has a particle retention of 0.5 m. It has >20x loading capacity of an equivalent porosity MCE or CN membrane and >15x the flow rate. Back pressure is nearly non-existent in comparison to surface membranes. Chemically inert, pure binderless borosilicate glass with no sizing additives or other surfactants. Low background noise in LC/GC/MS and very low extractables in presence of aggressive solvents. There are many filter materials which make the claim of "nano-scale" fiber, but Grade A83 is tested by an independent laboratory using the latest in fiber analysis and SEM image quantification. With >85 of the fiber content between 300nm -100nm, this material is truly one of the highest surface area binderless glass microfiber products on the market today. GRADE A - Fine porosity, fast flow rate, with a 1.6 m size particle retention. Frequently used in the filtration of precipitated proteins and cells. Ideally suited for use as a filter for radioimmuno assay of weak beta emitters by scintillation counting and gravimetric determination of airborne particulate. Binderless borosilicate glass micro fiber. GRADE B - Fine porosity, medium to fast flow rate, with a 1.0 m size particle retention. Ideally suited for the collection of biochemical polymers that have been precipitated by denaturation. This material is twice as thick as Grade A with a higher loading capacity. May also be used as a solid particulate filter for gasses or as a prefilter. Binderless borosilicate glass microfiber. GRADE C - Fine porosity, fast flow rate, with a 1.2 m size particle retention. Primarily used for RIA procedures and harvesting lymphocytes. Binderless borosilicate glass microfiber. GRADE D - Coarse porosity, fast flow rate, with a 2.7 m size particle retention. Well suited for higher volume and repetitive laboratory filtering. Also ideally used as a general pre-filter to extend primary filter life. Binderless borosilicate glass microfiber. GRADE E - Fine porosity, fast flow rate, with a 1.5 m size particle retention. This material is an economical media for suspended particle analysis in water, cell harvesting, pre-filtration and air monitoring applications. Binderless borosilicate glass microfiber. GRADE F - Fine porosity, medium flow rate, with a 0.7 m size particle retention. Frequently used with Grade D to filter diluted aqueous solutions containing strong oxidizing, acidic, or alkaline components prior to laser spectroscopy. May also be used for TCLP analysis and collecting extremely fine precipitated proteins, including immunoglobulins. Binderless borosilicate glass microfiber. 934-AH - Fine porosity, fast flow rate, with a 1.5 m size particle retention. This material is the standard for volatile suspended solids content and related measurements (Standard Methods 2540D and EPA Method 160.2). Also widely used in cell harvesting applications and RIA scintillation counting. Binderless borosilicate glass microfiber enables use up to 550 C.
GRADE A-E - Fine porosity and fast flow rate, with a 1.0 m size particle retention. Binderless borosilicate glass microfiber. DOP efficiency is 99.98 . Primarily used in suspended solids and air monitoring. Grade TSS - Binderless high efficiency (HEPA type) filter medium. Liquid filtration properties have been specifically designed for EPA Methods 2540C and 2540D for testing dissolved and suspended solids in water and wastewater. High flow rate with high capacity. Binderless borosilicate glass fiber media has no added extractables to aid in the elimination of sample contamination. Excellent wet strength. Other common applications include gravimetric analysis of air pollutants, membrane support pads, membrane prefilters, clarification of reagent and buffer solutions, filtration of eluent for HPLC and moisture analysis pads. Grade VSS - A binder free material manufactured using a proprietary glass chemistry which permits usage in high heat applications beyond typical borosilicate glass blends. Ideally suited for determination of "Fixed Voaltile Solids Ignited at 550 C Method 2540E. Low fiber shedding improves quality assurance of test results and low percentage of weight loss when used in gravimetric tests. High loading capacity is an attribute of the high surface area and complex pore structure. Material is also compliant with the requirements of standard methods 2540C 2540D and EPA Method 160.2 for establishing water quality in suspended solids content. Total Suspended Solids (TSS) are defined as those which are retained by a "glass-fiber filter disk without organic binder". Also widely used in air pollution monitoring, high temperature flue gas and filtration of high temperature solvents. 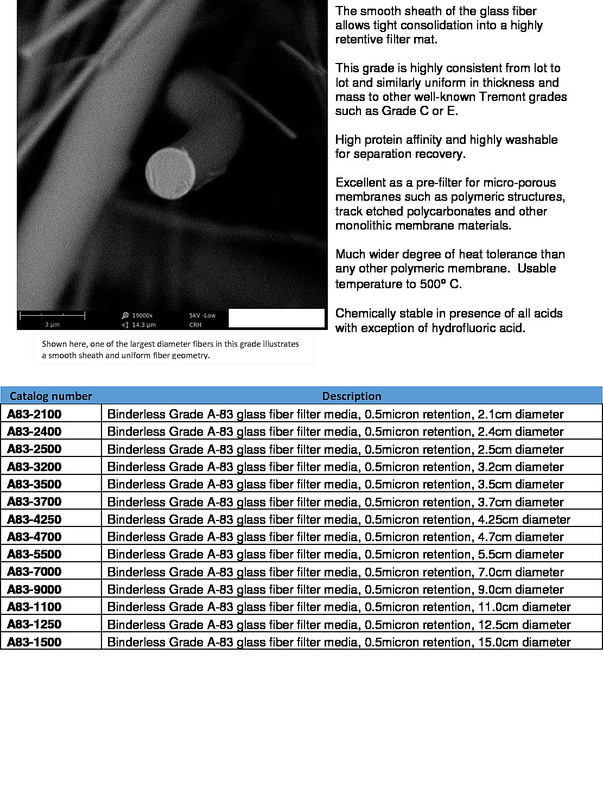 Grade TCLP - Binderless borosilicate glass microfiber filter media with a particle retention of 0.7 m. Acid treated and multi-stage deionized water rinsed to conform to EPA Method 1311. Inherently low Barium and Zinc Borosilicate Glass and resistant to acids and bases. Recommended for use in U.S. EPA Method 1311 "Toxicity Characteristic Leaching Procedure". Method scope: "The TCLP is designed to determine the mobility of both organic and inorganic analytes present in liquid, solid and multiphasic wastes." Saves time and waste disposal expense in the lab by eliminating technician acid treating and rinsing procedures. Depth filtration categorizes filter media that traps particulate within the random matrix of fibers found within the thickness of the media. The efficiency rating of the filter is characteristic of the complex void space structure that develops as the fibers overlap. The fibrous material within the filter is commonly glass microfiber, cellulose or polypropylene. In depth filters using glass microfiber, the purity of the filter is dictated by the presence of, if any, binder material that acts as a strengthening agent and aids in holding the fibers together. All of the media described on this page are 100 borosilicate glass and free of binders. Because of the characteristically high flow rates of depth filters, they are generally used in applications such as single and multi process removal of sediment and coarse particulate. Glass microfiber filters without binders are an ideal medium to entrap sediment for further analysis and counting due to the inert matrix. Also, depth filtration media are commonly used for pre-filtration prior to surface filtration with substrates such as membranes. 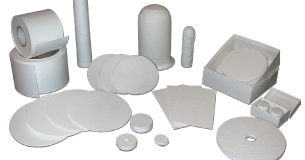 Tremont offers an impressive list of manufacturing capabilities and expertise in glass microfiber and cellulose filter media. We leverage a longstanding and contractual relationship between several mills to put 6 papermaking machines and formers into production. With this enormous capacity at our disposal, we are able to take a project from lab bench through pilot scale and ultimately full production with ease. Our partner mill ouput exceeds 120 grade variants manufactured in the USA and internationally. With chemists and scientists of several disciplines, experienced papermakers, the finest controls-on-machine plus a rigorous QA protocol, it is not often a project challenge is beyond our capability. After the papermaking process is complete, our experienced converting staff brings your project from large master rolls down to narrow reels or sheets with ease. Sheeting, die cutting and other unique converting operations are performed at our Hawthorne, NJ facility under our strict ISO production environments.